Sixth Annual Border Museum Association Scavenger Hunt continues through July 20, 2014. Take a self-guided walking tour of the UTEP campus. Stop by the Centennial Museum for a map. Haskell M. Monroe, Jr., an educator and administrator, served as president from July 14, 1980 to June 30, 1987. Haskell M. Monroe begins his tenure as president of UTEP (July 14, 1980), Sports Illustrated publishes an article entitled “In an Alien World,” describing racial tensions in the UTEP athletic program a mere two years following the school’s NCAA championship in basketball with an all black starting lineup against the University of Kentucky. View the article HERE (July 15, 1968), Federal Judge Robert E. Thomason rules school segregation at TWC and within Texas is unconstitutional (July 18, 1955), James T. Petzold takes command of the campus police department. His first act is to revamp the department following recent legislative action that gives full police powers to campus officers, including the authority to carry weapons (July 19, 1967). On Campus – The second “UTEP History” Walking Tour took place on the UTEP campus. The UTEP Wellness Program held their last mini health fair. The program offered six mini health fairs where UTEP students, faculty and staff were offered free health screenings including free blood pressure, cholesterol and glucose checks. Tickets for the Centennial Night at the Chihuahuas Baseball Game were also available for purchase. See more information below. 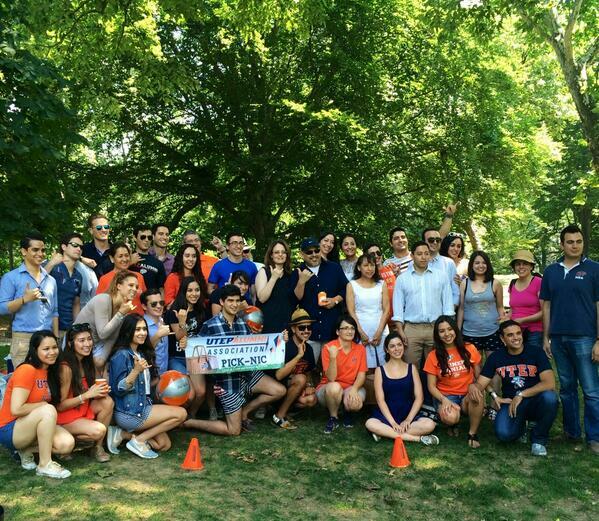 UTEP Alumni in New York City celebrate the third annual UTEP Alumni Association PICK-NIC in Central Park. In the Community – The Alumni Association held the third annual Alumni PICK-NIC. Hundreds of UTEP Alumni attended the event at Memorial Park in Central El Paso while 25 PICK-NIC’s were held across the country and around the world! Share your pictures by sending them to 2014@utep.edu. The Border Museum Association continues the Sixth Annual Museum Scavenger Hunt. This year’s theme is “Centennial Connections,” in honor of the 100 years of UTEP history. Participants have two months to visit the museums and find the mystery objects. This year’s Hunt includes two dozen museums in the El Paso/Las Cruces/Cd. Juárez border region. The hunt will conclude on July 20 and winners will be announced on Aug. 9. Announcements – The El Paso Chihuahuas will be celebrating UTEP’s Centennial with a game night on Aug. 28, 2014. Make sure to purchase your tickets early! Information about ticket costs can be found HERE. Centennial Stories – Stay tuned for more Centennial Stories. 100 @ 100 – Interviews with Mimi Gladstein (Department of English) and Max Grossman (Department of Art). Tune in this week to hear interviews with Barbara Zimbalist (Department of English) and Sara Grineski (Sociology). El Paso Times Series –Article on the history of the Centennial Museum. In the News – Stay tuned for more stories featuring UTEP in the news. If you would like your event to appear on the Centennial Calendar, email 2014@utep.edu.